As Western culture has embraced practices like meditation and yoga, has something been lost in translation? “What we see in America today in both the yoga boom and mindfulness fad,” writes Dr. Miles Neale, “is a presentation of technique alone, sanitized and purged of the dynamic teachings in wisdom and ethics that are essential for true liberation.” For anyone seeking a path dedicated to both authentic personal growth and the overthrow of the nihilism, hedonism, and materialism that are threatening our planet, this compelling teacher presents a well-conceived, sustainable solution with Gradual Awakening. The mass-market dilutions of Eastern wisdom that focus on symptom relief and easy answers have left behind the ultimate promise of spiritual practice: enlightenment. “Enlightenment is an unfolding process—open to everyone.” writes Dr. Neale. For most of us, this path to awakening must be realized through a gradual process: building on incremental insights into who we truly are, learning to care for ourselves and others, and discovering creative ways to engage the problems we all face. 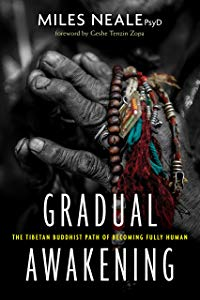 Gradual Awakening will serve as a lifelong companion for anyone willing to embrace a new paradigm that integrates science with spirit, theory with practice, and personal meditation with the desire to transform the world. A portion of the proceeds from this book will benefit the Buddhist nuns of Kopan Nunnery in Nepal.